For the Echo Summit at Johnson Pass in Utah & the Echo Canyon summit in Utah, see Onequi Mountains and Wahsatch, Utah. View from Echo Summit towards Lake Tahoe. Echo Summit is a mountain pass over the Sierra Nevada in the western United States, located in eastern El Dorado County, California. 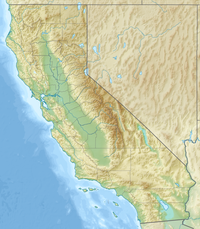 At 7,377 ft (2,249 m) above sea level, it is the highest point on U.S. Route 50 in California, which traverses it at postmile 66.48 between Twin Bridges and Meyers, south of Lake Tahoe. The "Sierra Nevada Southern Route" (aka the "Pioneer Route") of the Lincoln Highway, the first road across the United States, was routed over nearby Johnson Pass in 1913. The current alignment over Echo Summit was constructed between 1936 and 1939. 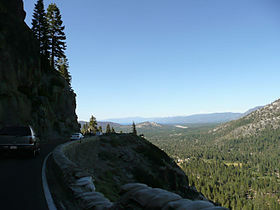 The "Sierra Nevada Northern Route" of the Lincoln Highway went over Donner Pass. Echo Summit is a trailhead for the Pacific Coast National Scenic Trail. Echo Summit is notable for being the location of the high altitude U.S. Olympic Trials and Training Camp in the summer of 1968, with the picturesque location being on the cover of the July 1968 issue of Track and Field News. The camp opened in July and the men's track and field trials were held September 6–16, a month before the high altitude 1968 Summer Olympics in Mexico City. The elevation of the track was 7,377 feet (2,249 m) above sea level, a mere 28 feet (8.5 m) higher than the venue in Mexico City. Four world records were achieved during the trials on one of the first Tartan tracks, constructed in the middle of the forest solely for this event. With a motel tax and financial support from Harrah's Tahoe casino, a synthetic track was purchased and installed which was very similar to that to be used in Mexico City. Installed southwest of the summit in the parking lot of a small ski area, hundreds of Ponderosa pine trees remained in the infield, densest on the north end. The high jump pit was also surrounded by huge boulders. The track installation was completed in early July and was designed to be easily dismantled and reinstalled, being moved the following summer to nearby South Tahoe Middle School where it survived until 2006. The location became a California Historical Landmark in 2014 with a roadside sign along Highway 50. At the time, this was only the 5th sports-related historical site in California. The ski area, known as Nebelhorn and later Echo Summit, closed in 1988. It is now Adventure Mountain, a snow play area for sledding and tubing. ^ "California Highways (www.cahighways.org): Routes 49 through 56". www.cahighways.org. Retrieved 2018-05-15. ^ a b c d 1968 Olympians Return to Echo Summit, USA Track & Field, Bob Burns, June 27, 2014. ^ "U.S. begins first work at altitude". Spokesman-Review. Spokane, Washington. Associated Press. July 16, 1968. p. 13. ^ a b Payne, Bob (August 16, 1968). "Olympic camp's press 'ban' unpopular". Spokesman-Review. Spokane, Washington. p. 18. ^ "Vanderstock shatters record; Ryun 7th". Eugene-Register Guard. Oregon. Associated Press. September 12, 1968. p. 1B. ^ Underwood, John (September 23, 1968). "Triumph at tragedy at Tahoe". Sports Illustrated. p. 18. ^ Burns, Bob (July 3, 2000). "Magic Mountain". Chicago Tribune. Retrieved October 11, 2014. ^ "Echo Summit" (PDF). State of California. Department of Parks and Recreation, Office of Historic Preservation: Application for Registration, California Historical Landmark. December 20, 2012. Retrieved October 11, 2014. ^ Burns, Bob. "Echo Summit". Pacific Association. division of USA Track and Field. Retrieved October 11, 2014. ^ Reed, Kathryn (June 28, 2014). "1968 U.S. Olympic track team, Echo Summit training site continue to make history". Lake Tahoe News. Retrieved October 11, 2014. ^ Reed, Kathryn (March 3, 2014). "Old ski lodge set to open on top of Echo Summit". Lake Tahoe News. Retrieved October 11, 2014. ^ Kingman, Bill (June 1, 2014). "Then and now: Echo Summit ski resort changes". Lake Tahoe News. Retrieved October 11, 2014. This page was last edited on 5 January 2019, at 20:47 (UTC).